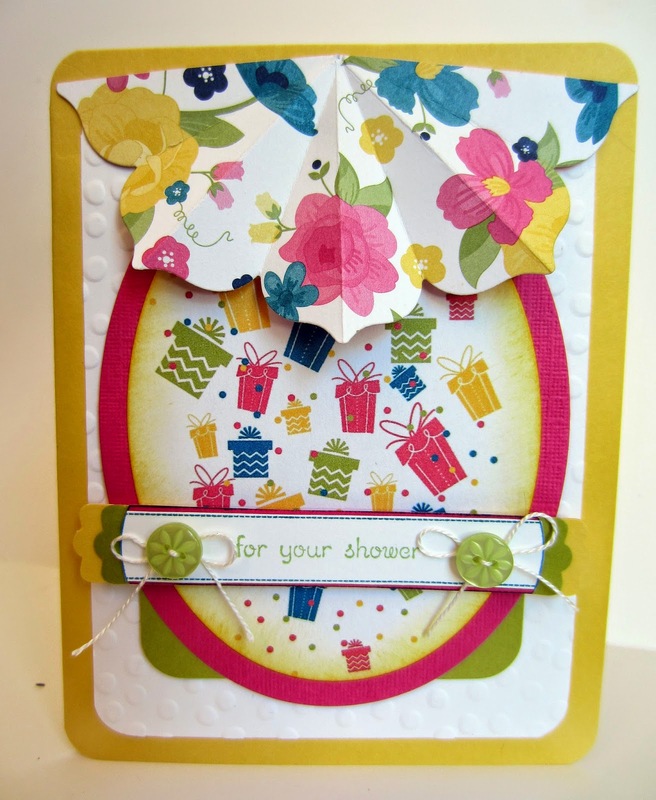 I am always so excited when someone asks me to create a card for a special occasion. The other day I was commissioned to make cards for a bridal shower and a wedding. Without hesitating, I agreed. I've made many wedding cards, but, to tell the truth, I don't think I've ever made a bridal shower card. Wow! Talk about planting LOTS of little Paper Seedlings! I had ideas flurrying around in my brain like crazy! 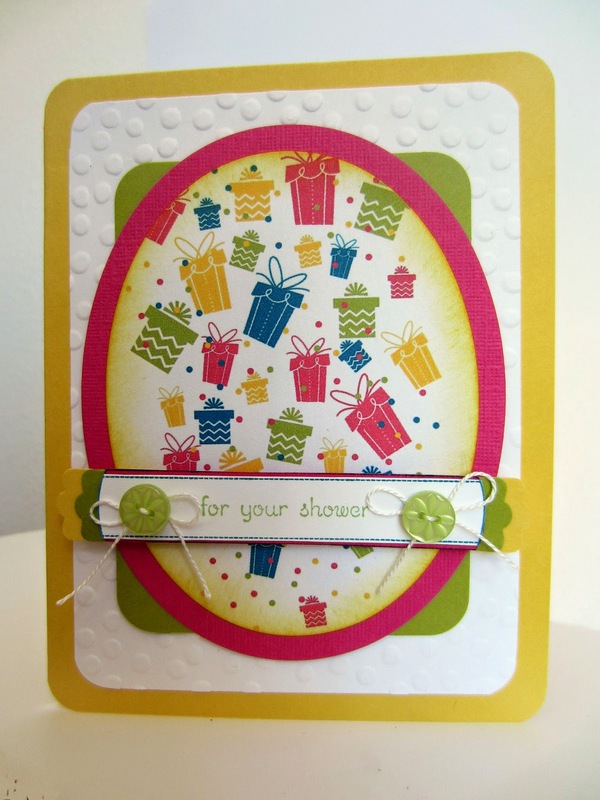 Of course, my first thought was to use a cute Stampin' Up! umbrella stamp from a set I'd had forever. It was large enough that it would have served perfectly as the focal point of the card. Unfortunately, after digging through my huge stash of stamps, I failed to find it. As you know, I had done major purging a few months ago, and I would be willing to bet it was among the 80+ Stampin' Up! sets I sold. Great great great. I just had umbrellas in my head, so I searched for something else that would suffice. I even would have ordered a set if I'd found the perfect one in the new catalog. But nothing in there either. Umbrellas. Umbrellas. Hey! How about MDS (My Digital Studio)??? Surely there would be an umbrella image in all my downloads stash. Search. Search. Nope. What now??? OK. I could make an umbrella shape -- from DSP maybe? I spent lots of time digging through my DSP for something that would make a cute umbrella. I finally found one from a retired pack. It would make a CUTE umbrella! I browsed through all my Framelit sets, hoping to discover something that would give the impression of an umbrella. Aha! Eureka! The two larger Framelits from the Floral Frames Collection look like modified umbrellas. Don't they?? So I cut a half flower with the second largest Framelit from my chosen DSP. An umbrella? Nope. A half-flower. So, I scored along the "ribs" of the would-be umbrella, and creased along these ribs. Now, we're getting somewhere. Hmmm. 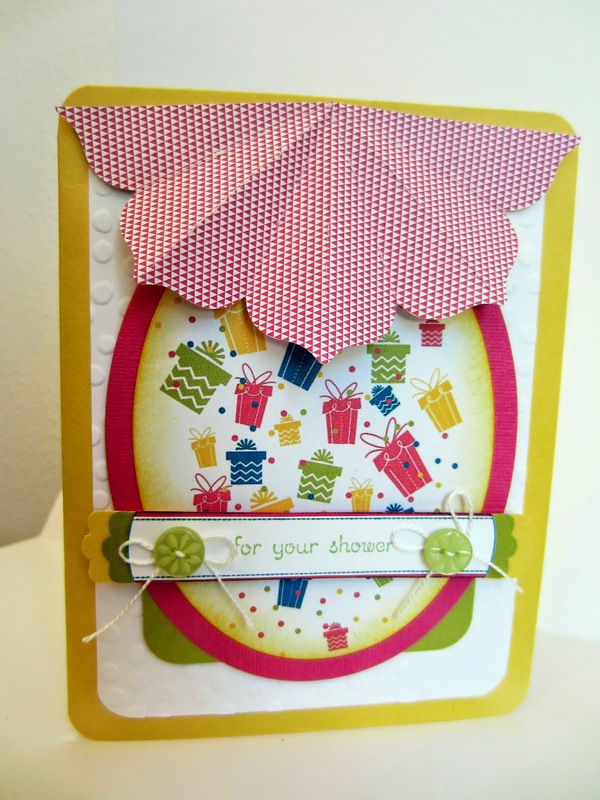 Adhere the "umbrella" to the top of the card and . . . have RAIN falling from it?? Uh. No. How about GIFTS??!? Back to MDS -- because I knew there were several cute little giftie packages in there, and I could make them in various sizes. Perfect! I got all my little gifts in place, resized and tilted the way I liked them. Ugh. It still looked empty. Something was missing. So I added MDS confetti! Perfect! Then I went to work "coloring" all the gifts and confetti in Melon Mambo, Island Indigo, Lucky Limeade and Daffodil Delight, to match the flowers in my "umbrella". After printing this out, I went to work putting the card together. I used more Framelits, including the new Project Life Cards & Labels (page 230), and the Ovals Collection. 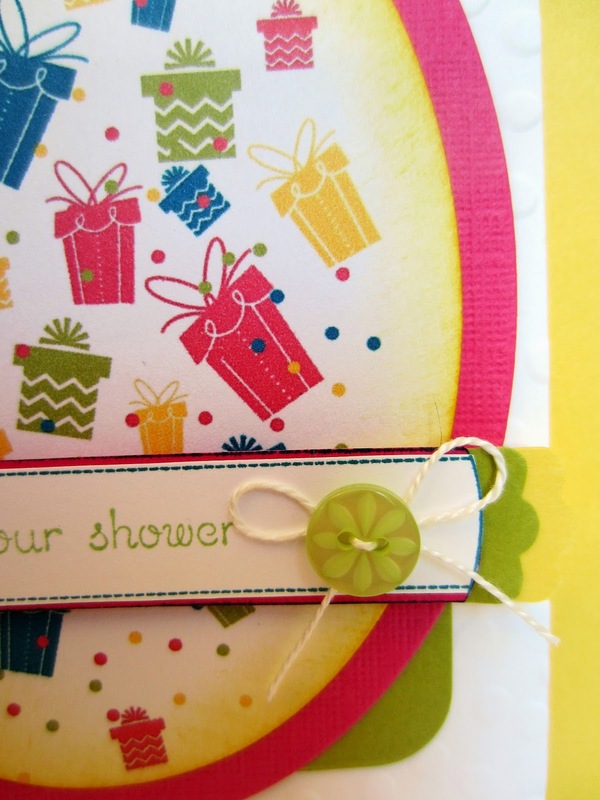 To mimic the confetti, I embossed the white background with the Decorative Dots Embossing Folder (page 226). 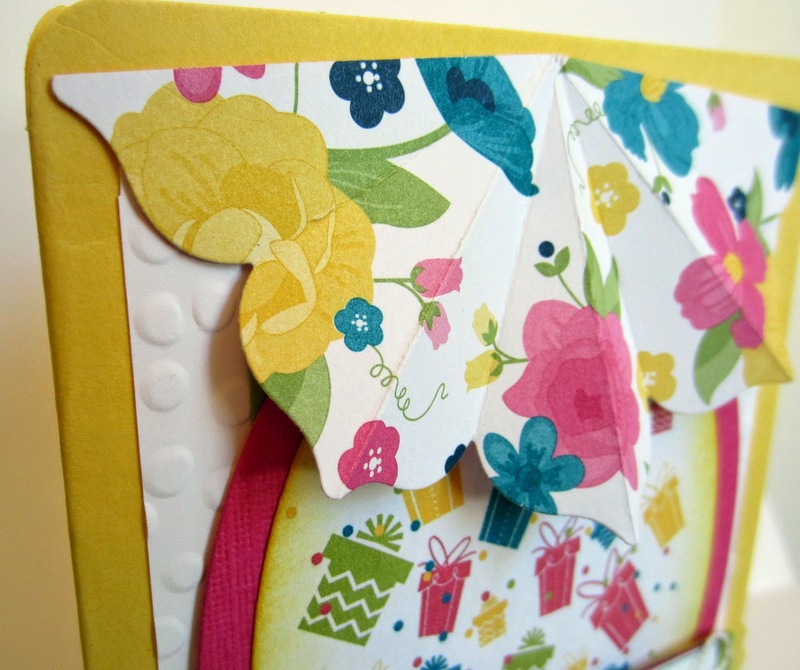 I rounded the corners of the card with the new Project Life Corner punch (page 222). At this point, I was ready to add the umbrella. Gulp. Is THIS the look I was actually going for? Busy busy busy. The other side of the DSP umbrella was a bit less busy. How about reversing the creasing and trying that? PLEASE NOTE: We must keep in mind that, at this point, the sentiment was not on the card. I just temporarily added these "umbrellas" after the card was finished for illustration purposes, to demonstrate how even the most carefully planted Paper Seedlings can go very awry. You know, they always say, "Less is more." Whew! What a journey! I hope you enjoyed taking it with me. Thanks for tagging along! You were having a wild time! I love the finished card. Those buttons sure finished the card just right. I love the dsp you used. I ended up not using ANY DSP. The falling gifts were created in MDS. Thoroughly enjoyed journeying with you. 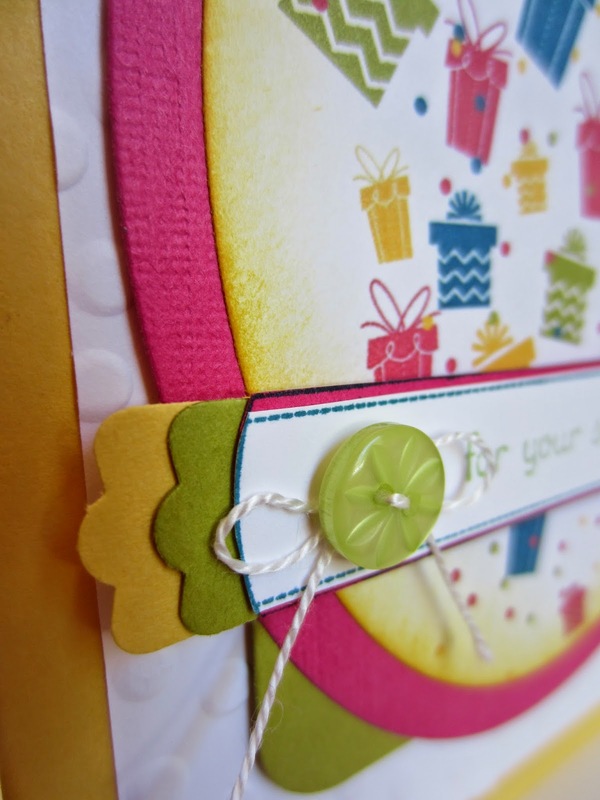 I love it all but to me the textured Melon Mambo cardstock really highlights the MDS falling gifts. What did you use to texturize the Melon Mambo cs? It was from a stash I had left over from an assorted package of textured cardstock. I do love it too! Thanks so much for joining the Say G'Day Saturday linky party this week. I've just pinned your posts to the Say G'Day Saturday board.